On this page I put together a collection of velocity problems to help you understand velocity better. The required equations and background reading to solve these problems is given on the kinematics page. A child on a horizontal merry-go-round gives an initial velocity Vrel to a ball. Find the initial direction and velocity Vrel of the ball relative to the merry-go-round so that, relative to the child, the ball goes around in a perfect circle as he’s sitting on the merry-go-round. Assume there is no friction between merry-go-round and ball. 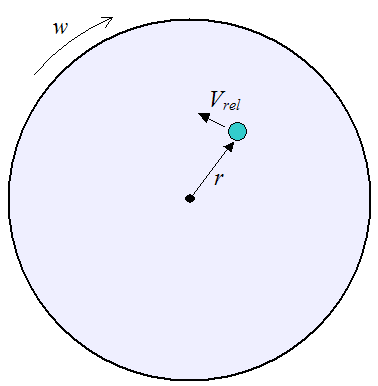 The merry-go-round is rotating at a constant angular velocity of w radians/second, and the ball is released at a radius r from the center of the merry-go-round. The seals around an engine piston are designed for a maximum velocity of 5 m/s relative to the piston wall. If the piston oscillates sinusoidally with a stroke length of 20 cm, what is the maximum engine RPM? The position of the piston can be expressed as P = (20/2)sin(2πft), where f is the engine frequency in Hz, and t is time. Differentiate this expression with respect to time to give the velocity of the piston. We have V = 20πfcos(2πft). The maximum velocity is equal to 20πf which is equal to 500 cm/s, as stated in the problem. Solve for f: f = 25/π Hz, which equals 25×60/π = 477.5 RPM.